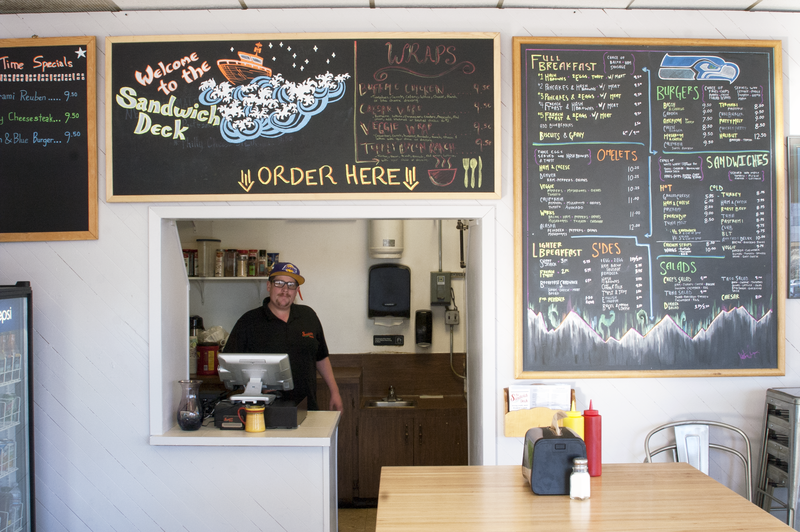 The Sandwich Deck has been in operation for more than 15 years. Although it has had several owners the establishment has continued to serve breakfast and lunch to downtown workers throughout the years and tourists during the summer season. The original name was a play on “Captain Cook’s Ship,” the deck where sandwiches were sold. When Shane purchased the restaurant in 2015 he was proud to carry on the tradition specializing in great sandwiches. Although he kept the name the entire restaurant was remodeled in 2017. Each day soups are prepared and handmade with fresh ingredients and specially spiced to bring home grown flavor and love to each bowl of soup served. All ingredients are fresh and the soups are perfectly balanced to provide amazing flavor and spice to favorite recipes. Each sandwich is handmade after ordering. Breakfasts are cooked to order and the menu also includes biscuits and gravy with an extra punch to get that spicy sausage and pepper combo. Salads are expanding on the menu and all salads come with a choice of dressing, handmade each day. Fresh ingredients and specially made dressings keep each fresh salad served a culinary treat. 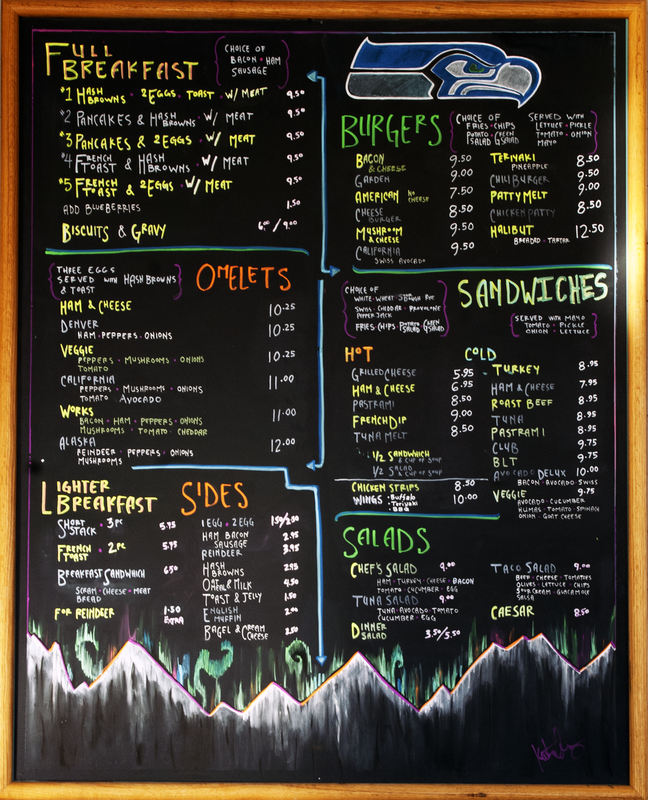 The Sandwich Deck also includes a large selection of Alaska plates, including salmon, halibut and reindeer. Try these delicious Alaskan ingredients in your omelets, salads, soups, burgers and sandwiches or try the deep fried halibut with fries. A great lunch special. Whatever you order you can be sure that the freshest ingredients have been used and the meals have been prepared just for you. Come and join us for breakfast or lunch. In the Winter our hours are 8 am – 2 pm Monday through Friday. Beginning in the middle of May we are open for the Summer seven days a week 6 am – 3 pm. Shane is a life-long Alaskan born in Fairbanks. He has lived in Anchorage and Girdwood for 30 years, with 20 years in the restaurant industry. Since purchasing the Sandwich Deck in August 2015 he is always at the restaurant cooking, serving and greeting customers. Greg is from Washington. In 2002 he began cooking on the train between Anchorage and Fairbanks. In 2004 he made Alaska his home. Greg is married, has two brilliant children, and 19 years in the restaurant industry. He enjoys the small town feel of Anchorage and getting outdoors at every opportunity. Kodiak was born in Texas and traveled extensively with his Airforce family, including two tours in Alaska. He graduated from East High in Anchorage in 2004 and Northern Arizona Univ. in 2009. He returned to Alaska in 2015 and began working at the Sandwich Deck in 2018.